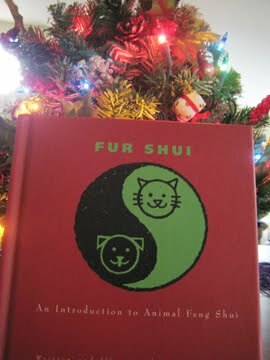 Happy Holidays from Fur Shui. 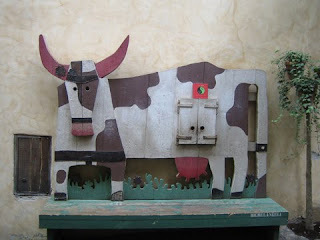 Been on a bit of a "holiday" from travel as of late. The colors red and green are very popular for the holiday season. 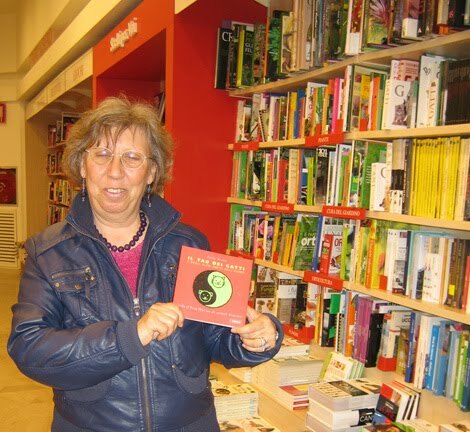 With Feng Shui, the color red is for fame and reputation and has the quality of increased "energy". It is a "re-charging" color for fur folks and non furry folks. Red helps us with a bit of extra energy we all need during the holidays...so, don the home with red and wear it as well during this short day, long night time. Green is for the family life space and the holidays are filled with green for sure. Trees, decorations, wreaths, garnishes, cookie sprinkles too! Put a green kerchief on your fur folk and see the family bonds get tighter. Warm wishes for you and your family this wonderful and cheery holiday time...and many thanks for your gifts of love, loyalty, and friendship this past year! 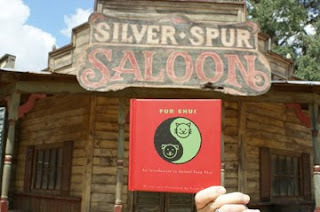 Fur Shui went to Andy and Melissa's wedding in Escondido, CA! It has been a very "Western" theme as of late for Fur Shui and its travels. 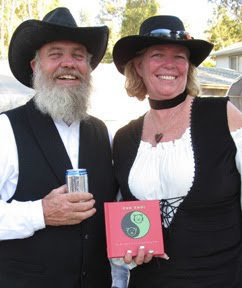 This month the book went with Lucinda to a wedding where the accent was definitely the old West with the bride and groom decked out in wild wild West costumes and Lucinda came as a native American. Lots of black was evident in the old time vests, suits and dresses, very formal...black is the color of life path...let the wedding couple have a long and prosperous life together for sure! The father of the bride and bride find Fur Shui to be amusing as well as the book seemed at home with the gifting and food celebrations! All enjoyed the day and cheers to the bride and groom, may they have many happy years together with much abundance and joy! 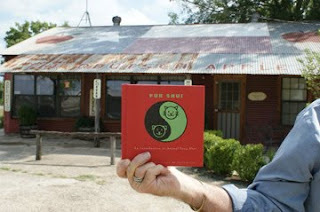 Fur Shui's Texas road show continues on to Blanco, TX! 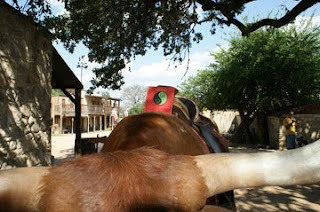 Blanco is a small cattle town established in the 1850's in the Texas Hill Country. Jim visited the 130 year old Blanco Courthouse and a restaurant that is more than 100 years old...reports are that the food is quite "fresh" though! Fur Shui is gobbling up many miles with Jim and is becoming quite the conversation piece with all the communities it has visited. Better charge up in the travel life space upon return home to Austin...more adventures to come! 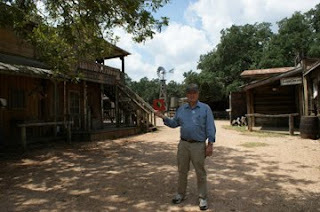 The wild wild West tour with Jim continues for Fur Shui at the Enchanted Springs Ranch, TX. 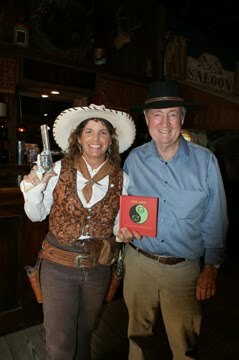 Now the book visits "Boot Hill" and the "Silver Spur Saloon". 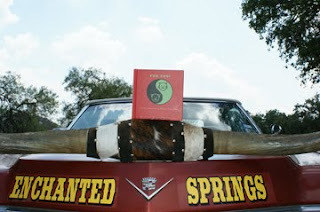 Then on to more of the modern era riding atop Steve Schmidt's 1964 Caddy...watch out for those pointed long horns...wahooo! "Pointed" objects as well as the car's hot red color do find their home in the fame section, of which this Caddy is quite a local famous site while driving in and around Austin! 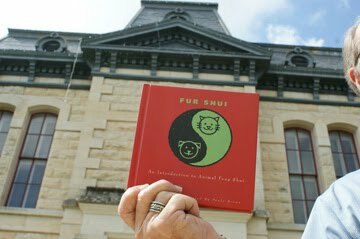 Fur Shui travels to Texas! In the summer at that! Jim hit the "trail" with Fur Shui to the Hill Country 5 miles west of Boerne, TX to visit the Enchanted Springs Ranch. 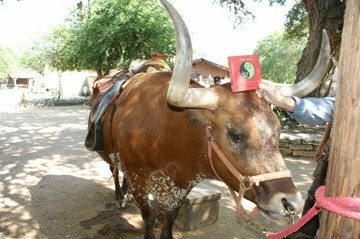 Their adventures included a visit with some pretty little tame dears, strolls down the complete western town (lots of Western films shot there), greetings with a very patient long horn steer (this one's name is "Big Red"...and seems to enjoy taking the book for a ride), and a meet up with the very famous "Pistol Packin Paula" (no, not me...but looks like fun!). Paula's white hat is the color of creativity and she is very well know for her "trick shots"! More adventures later! 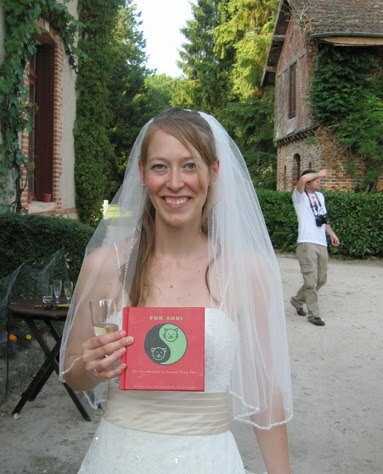 Wedding bells rang for Mary Jane's (my fun Italian travel mate) niece recently in the beautiful location of Salbris, France. 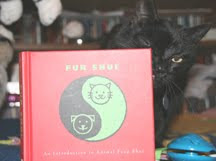 Fur Shui came along with Mary Jane for the festive family occasion. The pretty bride wears white; the traditional wedding color which in Fur Shui/feng shui is the color of creativity and children. Red is the color of fame and with this comes good luck and fortune when present at weddings and celebrations. Fur Shui says good luck and prosperity comes to the wedding couple and all their family. Wealth and well being for their special union and beautiful day! Félicitations et bonne fortune! Congrats! 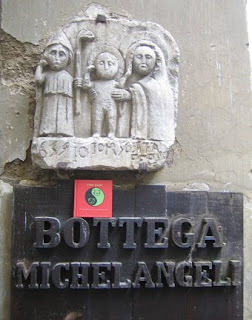 Shui perches atop a square in Cingue Terre and then travels on to Orvietto. What beautiful places it popped up in. Orvietto was grand with its small winding passages and unique shops! 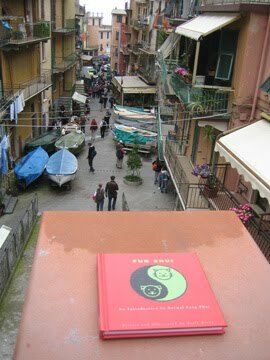 Italy!!! Finally caught up with Fur Shui (Il Doa de Gatti....red spine next to other famous books!) in its new home in Italy. The book is doing very well and here is how it looks in "Italian". 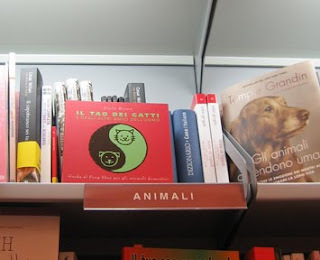 First spotted in Milan at Mondadori book store off the Duomo square. Great friend Ida who lives in Milan lead me to the book as well as gave me a great tour of Milan and good friends who love animals and nature. 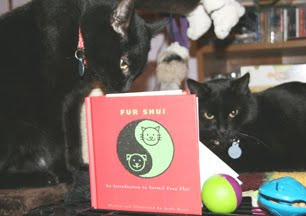 Bella "Fur Shui" and Ida!!! 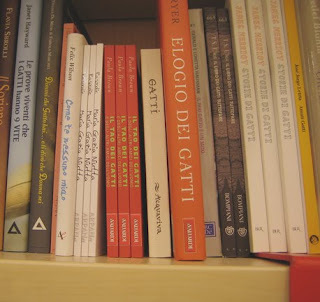 Red is the color of fame and reputation and now the book has both in Italy. Be sure to add some red to your animals collar or leash if you want to get them going strong...red energizes and animal and they love it!! 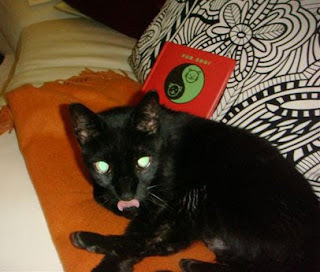 Fur Shui really put some miles on with Glenda from New Hampshire! The book went with a little side kick "witch" called Esmerelda all the way from NH to Bowling Green Kentucky to take part in the National Corvette "All things Corvette" convention. 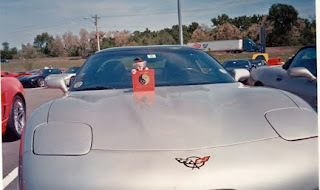 Fur Shui's "mom" drove her silver grey Corvette named "The Grey Ghost" down this year late April, Early May. Grey is indeed the color of Helpful People and Travel and Glenda sure did this in style with Fur Shui and Esmerelda. Grey and travel are great vibes. 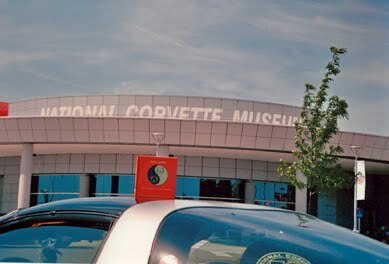 Glenda is the New England Chapter head for the Corvette club in her part of the country. Congrats on the trip which included stops for new colt and fillie ooooing and ahhing in horse country as well as a few enjoyable trips to Lincoln's log cabin, Red Rose distillery and the such. 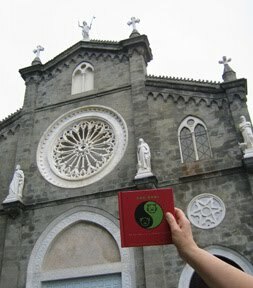 Thanks Glenda for taking little Fur Shui for a neat road trip! Vrrroooom, vrooooom, Fur Shui! 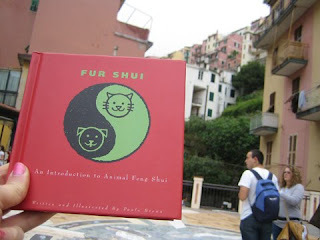 A big Fur Shui "hello" from Portland, Oregon! 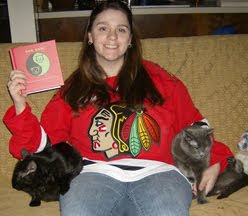 Angie, the person for Kali and Gizmo sends their regards from the Pacific Northwest. Folks are getting right into the New Year with the color red it seems. The nice gold covered couch is perfect for more health and balance for both fur and non fur folks. Gold / yellow is the color of health and balance! Here's what Angie has to say about her adventures and pets: "Kali (left), Gizmo (right), and I have been together for 14yrs. Both of them are very well traveled, including a year of seeing the USA via semi-truck. We share an apartment with our cockatiel, Moll E. and he makes all the rules. His chewing on their tails is enough to keep them under cover when he is socializing with us. Kali and Gizmo are a little camera shy but I was able to convince them to take a quick photo in one of our favorite places to relax." 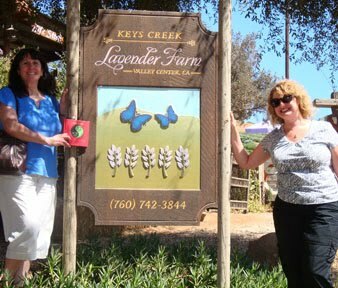 Thanks Angie for getting a great photo in for the Tour! 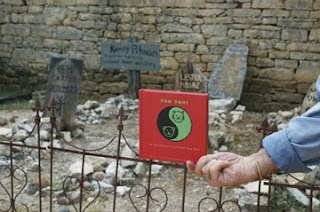 Red and Black are the colors that appeal to Blackjack the cat on the Tour de Fur. Blackjack is from Laguna Beach and is needing a little bit of extra energy now, so red is good for a "boost" and also add a yellow bed, ribbon or blanket to his space. His health is now needing attention and yellow is the color of health and balance and can be of comfort to Blackjack now. Cindy tells about Blackjack: "This is Blackjack (15) who unfortunately has cancer and hasn't started treatment yet! We are struggling with him being sick as his big "brother" Lucky (a 90 lb. pound puppy) passed a little over a year ago after 14 years together. Thanks for letting Blackjack be a part of your journey and good luck with your endeavors." 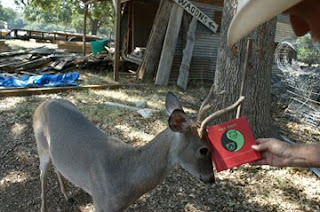 I send Cindy, Blackjack and some pink energy from the love gua to now help out with his health issues. Happy New Year! Enzo here from Portland, Oregon! 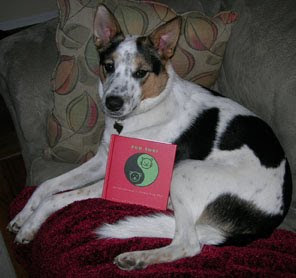 Here's what his person Dena tells me: "Enzo enjoys cuddling up while reading a new book and on Sunday I found him reading his very own copy (or so he though) of Fur Shui." He is curled up on a nice RED throw...red is the color of the Fame life area. Animals tend to "re-charge" with red...Enzo is helping Dena make this a very "famous" new year!